At least one zigbee coordinators are acts as a root and bridge of the network. The coordinator are responsible for handling and storing the information while transmitting and receiving operation. Coordinator and end devices always depends on the types of topology like star, tree and mesh. Zigbee router are internally devices while end devices have limited functionality to communicate with parent nodes. So battery power is saved. 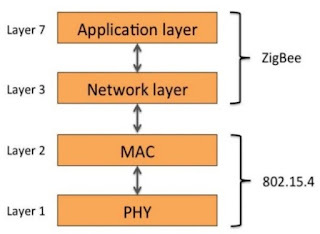 Zigbee architecture consists of various layes where IEEE 802.15.4 is defined as a physical layer and MAC layers. Physical layer : This layer does modulation and demodulation operation up on transmitting and receiving signal respectively. 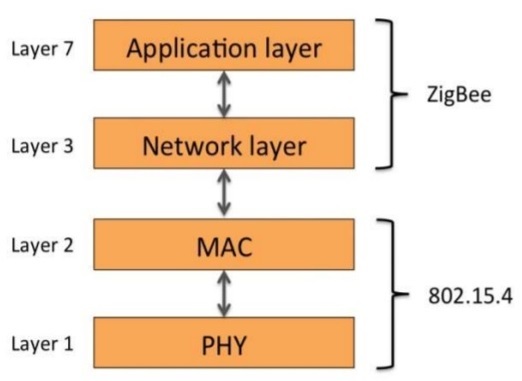 MAC layer : This layer can be used for synchronizing communication. It is releible transmission of data by accessing different network with CSMA. Network layer : This layer can be used for network set up, such as disconnect network, routing, device configuration, network set up etc. Application support sub layer : This layer interface with the network layers for data managing services. Application framework : This layer is responsible for detecting, initiating and binding other device.